Would you look at the colour of this soup! Super-vibrant! Its made in one-pot in less than 30 minutes! Entire northern part of India is engulfed in really cold weather and there's nothing better than a hot and comforting bowl of soup on a chilly night. I love making different kind of soups in cold weather and you will find so many soup recipes like this Mexican black bean tortilla soup, Cream of mushroom soup, French onion soup and many more on blog. There's no denying the fact that I love love love pesto and this vibrant green and detoxifying soup was one more of an excuse to use pesto again in a recipe. It's loaded with vegetables and very simple and easy to make.You can use store-bought pesto to make this soup but I recommend using homemade pesto which can be easily made at home. Recipe of basil pesto is already on the blog. Lets talk about pesto! Its made with basil leaves which supports liver function and helps detoxify body by flushing out unwanted toxins. 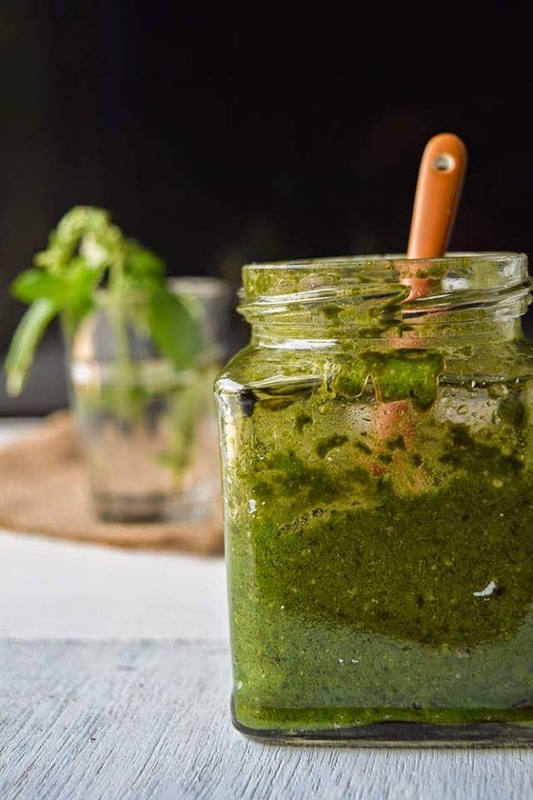 Pesto is one of my favourite condiment and you can create tons of recipes with it. I love making Pesto pasta with balsamic burst cherry tomatoes and using it to make bruschetta and crostinis. Pesto can also be used to make vinaigrette to dress salads like this fresh and crunchy Watermelon and tomato salad. You can use a medley of vegetables for this soup, pretty much whichever vegetables you have in your fridge. Traditionally pasta is added in minestrone soup but I have not added it to keep this soup healthy. Go ahead and add pasta if you wish to turn this soup into a complete meal. Add in some grated cheese to make it even more flavourful. Super healthy and detoxifying pesto minestrone soup- easy and flavourful! Heat oil in a deep pan/pot and add chopped onion. Cook till onions are slightly golden in colour and then add garlic. Next add baby-corn and carrots. Season with salt and pepper and cook covered with a lid. Once baby-corn and carrots are slightly done, add in french beans, Cook further for 5 more minutes. At this point add 3 cups of water/vegetable stock along with mixed herbs and chilli flakes. Cover and let the soup simmer on low heat for 10 minutes. Now add pesto and stir properly. Cook the soup further for 5 more minutes and turn off gas. Finish the soup with lemon juice. If you try the recipe, don't forget to leave a comment. Also do take a picture and tag #fascinatingfoodworld on Instagram.